Over the years there have been many fascinating vehicle rebuilds, many based on sound economics and engineering feasibility, but this one must surely be one of the most bizarre and ambitious. The chassis is a Leyland Lion LT5A, registration number JP 42, which had originally been a Santus bodied coach with Smith’s of Wigan – nothing particularly unusual in that. The Lion LT5A was, though, essentially a lightweight chassis fitted with either a 5.1 litre petrol engine or a 5.7 litre diesel unit – adequate for moderate single deck bus or coach work. Therefore to fit such a chassis with a double deck body seating 55 and, no doubt in WW2, frequent large numbers of standing passengers was, in my view, "pushing it." The photo shows that the small wheels of the light Lion have been retained – hopefully stronger springs were fitted – and the downward slope of the bonnet towards the rear raises the awful spectre of chassis distortion best not thought about. Personally I would have had great trepidation in driving or travelling on this unique vehicle, although normally I was always eager to sample anything new or out of the ordinary – and unique it is said to be as it is believed to be the only centre exit utility double decker ever made, by Northern Coachbuilders or anyone else. The source of the picture, sadly one of poor definition, is unknown to me – but as it was taken in August 1949 what must have been an unwieldy vehicle had at least managed to remain standing for a few years. Wonderful: I can hear it screaming off in first gear and spending the next quarter mile engaging second. Presumably desperate times brought desperate remedies and you don’t get much more desperate than this. Why centre entrance- because of the chassis? I can only imagine that Leon carried large numbers between Doncaster & the RAF stations at Finningley & possibly Lindholme. But why….? I’m so pleased you posted this Chris because it truly is a fascinating vehicle. Like the saying goes, desperate situations require desperate remedies and they don’t come more desperate than this! I have a copy of the Prestige volume which contains a similar photo but this one was clearly taken on a different occasion. The view in the book shows it having a large headlamp on the offside and the very small one on the nearside but in this shot, it has lost the offside lamp and the hole has been patched over. In both, however, it has the same hardboard or cardboard repair to the upper deck front window so it would seem that it ran with that feature for some time! Would the centre entrance have been dictated by the fact that it was a single deck and therefore straight frame chassis? although this didn’t pose a problem for later large scale re-bodying of single deck chassis. Was it also the only double deck utility to have doors? These interest me because they appear to hinge inwards yet there is no sign of a handle on the one which is closed, it would have been more logical to have a porch type entrance with doors which pushed outwards but perhaps this was simpler and required less bodywork, also they seem to be quite deep with no recess to clear a step so presumably it must have had just one step with a large stepwell area inside the doors. What a wonderful creation! LT5A’s seem to date from 1934, so it was far from new when re-bodied. Is it an austerity body – it seems to have signs, but were any centre-entrance/staircase austerity bodies built in the war? I wince to see this poor chassis putting up with the burden imposed on it: it’s well-laden here. How it kept going until at least 1949 is a miracle. And no body sag; more than can be said for the chassis, as Chris Y points out! Is the area it operated in hilly? Incidentally, I notice that there is still a Leon Motor Services in Doncaster, presumably the same company. It may be just the camera angle but it looks to have quite a long wheelbase and shortish overhang beyond the back axle, thus not leaving much room for a rear platform and staircase. As the LT5A was usually bodied as a coach to, presumably 27ft a double deck body would be no more than 26ft at this period so this may have something to do with body being centre entrance. However, the door arrangement does seem to be rather unusual. It would certainly have been quite handy had the bus gone on to become a caravan/holiday home! Yes Chris H, Leon are still running. The topography is dead flat: if you saw the "preservation" Vulcan bomber on BBC tv on 14/8, that was Finningley (now Robin Hood) Airbase/port. My understanding is that Leon sold out to MASS of North Anston some years ago who operated the services for a couple of years and then sold them on to First Group. Has the Leon name been resurrected in some way? I haven’t seen any sign of it on recent visits to Doncaster. My mistake, they are still listed on some internet sites but one phone no is now a private house and the other has been cut off. I notice that nobody has picked up on the rather unusual registration number JP 42 because nowadays it would be pounced upon by number plate dealers! In fact it is a correct plate issued by Wigan CC in May 1934 which is quite late for a "two letter" series to start reaching JP 8432 by 1950. What it does do is reveal the original date of the coach which later became saddled with this somewhat ambitious body! I don’t suppose anybody has a picture of the original vehicle when owned by Smith’s of Wigan..it would be a most interesting comparison! Chris, you ask who might have taken this picture? I thought it looked familiar, it’s featured in ‘Buses Illustrated’ issue no. 84 for March ’62 (orange cover, with a Salford Daimler saloon!) It was used to help illustrate an article entitled "Doncaster Re-Visited", and is credited to none other than the late John C. Gillham. In his wonderfully eloquent style of writing, another one of my schoolboy heroes, Tony Peart, describes it thus in the accompanying article ….. " More interesting still was a double deck Leyland Lion! This had a central entrance utility body by N.C.B., with a regrettable propensity towards catching fire and had run for a long time with a sheet of cardboard in one of the front windows." Doubtless your instincts were right and you would have done well to steer clear of riding on it had the opportunity ever arisen, but presumably the flames never made it quite as far as the cardboard window! "Regrettable propensity towards catching fire" – what a gem of a phrase and with typical British understatement! In its early days, this would have made it a toss-up whether the vehicle succumbed to enemy action before a conflagration! At least the cardboard front window gave an emergency exit front AND back of the upper deck! As for two-letter registrations, I was in the RAF in mid-1958, in Wigtownshire, Scotland, when they changed from OS9999 to AOS1. I would hardly think they got out of AOS before the whole shebang changed to suffixes in 1963! In London, where I lived then,I’d say they ran out in the 1930’s! Incidentally, what is known of Santus, who built the original coach body for the vehicle? I’ve never heard of them. William Santus was a Wigan market trader who also had a coach-building business. This business was dead certainly by the end of WW 2. I seem to remember, from the Venture book, that one of the founders of East Lancs did an apprenticeship with Santus whose assets I believe ended up with one of the more famous Wigan pair (Massey and Northern Counties). Santus was fairly common amongst Lancashire Independents. They actually built some service bus bodies for Wigan Corporation on 3 or 4 batches of Leyland Tigers in the 1932-7 period, I think to Leyland design. Anybody know of any more? I think the Leon Lion is one of the most iconic of all buses for the post war enthusiast, as I remember it well in various publications, notably "Buses Illustrated". Alan Townsin quotes it as the only double deck centre entrance utility body built, and NCB were, of course, designated "rebodying" contractors. There were single deck utility centre entrance bodies in the form of Brush/W4 wartime utility trolleybuses in Darlington and Mexborough. Santus were active long after the end of World War Two, surviving to provide bodywork for at least one Royal Tiger in circa 1951. In the late 1940s their half-cab coach design was fitted to most types and was widely seen throughout the Northwest and Midlands (and more rarely further afield). The firm probably ceased trading because many of its post-war bodies were built with poorly seasoned or otherwise inferior quality timber. Few survived much beyond 1960 although there are a couple of examples which made it into preservation including the well-known Seddon Mk 4 DPR 518. Thx, David/John/Neville (and Richard Leaman who popped up coincidentally with Sanctus information on the Vics Tours (Isles of Scilly) Bedford OB thread!. On the registration JP42, I believe that JP was the last pair of letters authorised for use based on the original 1904 scheme. By that date, Staffordshire had already started using the three-letter/three-number combinations with ARE/ARF in 1932. I wonder why JP wasn’t issued to them instead? Wigan had previously been allocated EK. Although the history of registration allocations may be different for N Ireland and what later became Eire, JP completed the England Wales and Scotland scheme until c.1960. At that point, the more controversial OO, BF and WC marks were authorised, and quickly used in both forward and reversed formats, with two plus four and three plus three letters / numbers. This was no more than a "quick fix" for Essex and Staffordshire, as between 1963 and 1965, all issuing authorities were required to start using the year suffix (later, prefix) system. Northern Ireland continues to this day to use it’s own interpretation, and the Irish Republic uses an altogether different system since having joined the EU. There was something special though, about looking down a line of, say, standard almost identical PD2’s with Leyland bodies, and identify their area or original owner just by looking at the key letters of the registration plate. Very satisfying. Michael, I agree wholeheartedly about being able to recognise area of origin from the old letters. There is, however, method in the new post 2001 scheme. These are just examples. There is a similar (sometimes slightly warped) logic to all the other marks. Reminds me of the old ‘Director’ phone system (in big cities)which relied on you dialling the first three letters. In London, it started logically: ABBey (Westminster), WHItehall & CLErkenwell, but, after running out of meaningful ones, used, for example, ARNold (Wembley) and the very Scottish RAGlan for a very unScottish Leytonstone! I would love to have been on XYLophone, but there were no X,s Y’s or Z’s used! But I digress! Yes, David and Chris, there are some obvious designations for the current registration system, and some intriguing ones, too. My comment about identifying identical PD2s, could similarly be said about modern Volvos or Scanias, etc, as the large groups transfer them around the country. In the old (1903) system, there were only a few letter sets that could be linked to the place of issue, although whether this was by accident or design I know not. Examples are DV (Devon), DT (Doncaster)and KH (Kingston-u-Hull). KV for Coventry must have brought a wry smile or two, and I once read that VT for Stoke on Trent was an oblique reference to Arnold Bennett’s "Five Towns" (using the Roman V for 5). Was that a purposeful allocation, or just accidental? Many L series went to London, and many M series went to Middlesex. But other big series like O for Birmingham bore no relationship at all. BG for Birkenhead was a near miss – should have been BK or BH or BD! Also of interest is the use some municipal operators made of their local series. In the 1950’s, Portsmouth booked each batch to end in 999 (GTP, LRV, ORV, STP and TTP). In Salford, the new manager just post-war decided he would only book RJ series and not use the BA series at all. Birmingham used a large quantity (all?) of JOJ. Glasgow booked the whole of both FYS and SGD, using some for service vehicles but the bulk for PSVs. The SGD use was curtailed by the introduction of the year suffix system. In pre-war days, some Glasgow buses were registered with the most appropriate BUS series, but the Corporation did not book the whole 999, and I don’t think the registration numbers matched the fleet numbers. In London, the first Routemasters used the appropriate "LT" series for significant quantities (SLT, VLT, WLT and reversed CLT). It was rather sad that the link between fleet numbers and registrations was lost at the introduction of the present system, with it’s use of letters instead of numbers for the sequential element. One I always recall is BMMO (Midland Red) which had registrations with HA in them, originally Smethwick, later Dudley. Thanks, Chris Y, for this extraordinary photo, which raises so many questions. 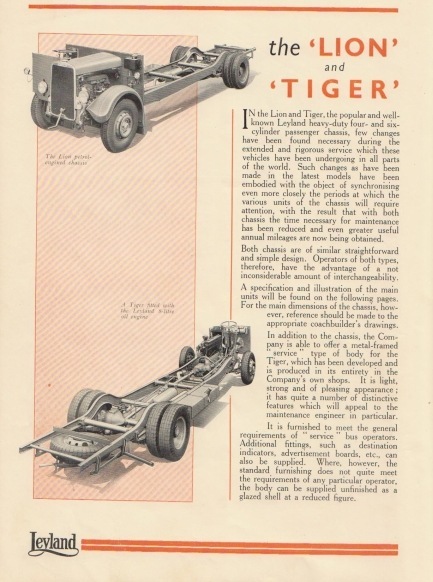 I too had assumed that the Lion was of lighter build than the Tiger—somewhere between the Tiger and the Cheetah—but the attached pictures suggest that, apart from engine and cab length, there was little difference between the two chassis, at least by Feb 1938. Perhaps the 1934 LT5A was a bit less sturdy. I grew up imagining that the Ministry of Supply had an absolute stranglehold over body design, and this Lion double-decker is the best and quirkiest counter-example of all. By the way, I’ve always had a soft spot for NCB bodies: everything—particularly the front dome and upper front pillar area—strikes me as just right. Forgot to say that my praise of Northern Coachbuilders’ design refers to postwar bodywork, which is not to belittle the angular charm of the centre-entrance d-d Lion! "I believe that JP was the last pair of letters authorised for use based on the original 1904 scheme. By that date, Staffordshire had already started using the three-letter/three-number combinations with ARE/ARF in 1932. I wonder why JP wasn’t issued to them instead?" Staffordshire started the three-letter marks in July ’32 with ARF 1, and my guess is that Wigan booked JP just before then. Similarly, Dorset started issuing JT registrations in November ’33 – so they, too, could have booked that code just before the three-letter marks were introduced. "As for two-letter registrations, I was in the RAF in mid-1958, in Wigtownshire, Scotland, when they changed from OS 9999 to AOS 1. I would hardly think they got out of AOS before the whole shebang changed to suffixes in 1963!" Well, Chris, Wigtownshire actually got as far as HOS before becoming one of the last areas to adopt the year suffix system, in September 1964. Thx, Des, for the interesting Wigtownshire information. In crude terms, 800 registrations in 6 years averages 133 new vehicles registered per year. Sounds very quaint in this day and age! Just to add to this scenario, I took my test in Stranraer whilst up there. Such was the demand, that the driving instructor only brought his Morris Minor down from Ayr every Wednesday afternoon to teach the locals. There was no instructor in Stranraer itself! Des..Just a very slight clarification wearing my number plate anorak. The suffix system did not become compulsory until 1st September 1964 although introduced originally just 12 months earlier. So the "A" suffix ran only from 1/9/63 until 31/12/63 and "B" started on 1st January 1964 but most authorities continued the 123 ABC format until they ran out at YYY 999 for example. Then, confusion occurs because vehicles that had old "collectable" numbers that were sold on, were allocated previously unissued "A"’s similar to ( here in Bristol) BHU123A. Again, this did not last long because then the DVLA started to use "SV/SU/FF" etc. in a three letter, three number style to give the age related numbers seen everywhere such as MSU 123. So..it’s not impossible to have a 1964 vehicle displaying an "age related" AAA 123A ‘plate and also..yes…built up Kit cars were often given "A"’s rather than "Q" plates and they can be of any age! NO!! !…enough men! I’ll go away and shut up now! Richard Leaman said, "The suffix system did not become compulsory until 1st September 1964 although introduced originally just 12 months earlier. So the "A" suffix ran only from 1/9/63 until 31/12/63"
I thought "A" suffixes began in February of 1963, when Middlesex issued AHX 1A? And, for that matter, the new Kirkcaldy authority issued AXA 1A etc from April ’63 (XA having been previously allocated to London), and Staffordshire issued ARE 1A etc from July. Also, the year suffix system became compulsory when "C" suffixes began on 1 January 1965 – though September ’64 is very likely to have been the time when this was decided upon, as all remaining areas still using the old schemes (notably Leeds, Hampshire and Bedfordshire) continued to do so for the final four months of that year. Hello Des! Thank you for the details re the 6/7 digit registration changes. I went from memory rather than looking anything up but had always understood that Middlesex was the first 7 digit series and had started in the September so I’m sorry to have got that incorrect. As regards the September 1964 date, it may well have been technically compulsory from 1/1/65 but I have never seen any registrations after Sept ’64 with less than 7 digits so have understood that to be the changeover date. Thank you for the clarifications though! Nine Scottish County Councils never reached 9999 with two letters, before starting the "year-letter" series in 1964 or 5. Bringing up the rear was Bute, which reached SJ 2860, an average of less than one vehicle a week! HD the mark for Dewsbury took from the start of its introduction until 1955 To change to AHD. And further to Geoff’s comment, the other eight Scottish counties that never reached 9999 with two letters were Clackmannanshire (SL), Kinross-shire (SV), Nairnshire (AS), Orkney (BS), Peeblesshire (DS), Selkirkshire (LS), Sutherland (NS) and Shetland (PS). This may be the Santus-bodied Royal Tiger to which Neville was making reference (18/08/11) www.sct61.org.uk/ On the same site can be found photos of Royal Tigers with bodywork by Thurgood, Churchill, Bankfield, and Auto-Cellulose – as well as by the more well-known builders, of course. Santus bodied nine Royal Tigers in total:- MTJ 774, NTD 447 both Fairclough, Lostock; NTJ 707 Victoria, Horwich; JP 9379 Taylor Bros, Standish; JP 9634 Eaves, Ashton-in-Makerfield; OTB 400 Walls, Wigan; LWX 446 Anderton, Keighley; FBN 902 Miners Convalescent Home; MWT 476 Forder, Bingley. Regarding the original owner of JP 42, PSV Circle British Journal gives the original owner as H Stringfellow, Wigan, noting that reference to Smiths is probably wrong. A quick Google of all the above registration numbers has produced a pic of MT J774 with Fairclough’s – not surprisingly, the body looks just like that on LWX 446. There is also a photo of 504 WLG, implied to be a rebuild of JP 9379, extended to 36′ and rebodied by Plaxton. The registration did ring a bell, and bearing in mind its place of origin I would say that the rebuild was effected at the behest of the Les Gleave group. This is getting a bit away from the original topic of JP 42 (heard that one before? ), but I wonder if anyone could tell me anything about Bankfield coach bodies, as mentioned above. There have been occasions in the past when I have been accused of having had an encyclopaedic knowledge of buses & coaches, but I have to say that Bankfield is a new one on me. Bankfield Engineering was based at Crossens, Southport. They bodied two Royal Tigers, NVM 832 new to North Road Engineering, Oldham in 1953, and OXJ 481 new to Mason, Manchester in 1954. I don’t believe I’ve ever seen photos of them. However, I have childhood memories of them, and I thought they both ran for Mason’s, who used a red and cream livery. I have a vague recollection that they produced at least one other body, but cannot remember any details. Very welcome information, thanks. The Southport connection didn’t come as a surprise since I had already picked up mention on the net of an ex-Hanson Leyland TS6 later running for a couple of Southport-area operators and at some stage receiving a Bankfield body. Issue 18 (Winter 2002) of the ‘Leyland Torque’ magazine refers to NVM 832 as ‘Mason’s Tours Royal Tiger’, so, yes, it would seem that both OXJ481 and NVM 832 operated for Mason’s. Perhaps they were trying to get the ‘set’. There is mention on the net of Bankfield having rebuilt fourteen Bolton Corporation TD5/Massey, two St Helens (ex-Wigan) TD1/NCME, and one Crosville (ex-York-West-Yorkshire) LT2/Roe. Further to the above, I wonder if you could tell me the source of information – was it a PSVC chassis list? I’m a little suspicious that NVM 832 should have had a Manchester, rather than an Oldham, registration. Could ‘North Road Engineering’ have been a ‘subsidiary’ of Mason’s? I have an old copy of Leyland Journal (the original version) from the early 50’s which shows a new Bankfield-bodied Royal Tiger. The PSVC records NVM 832 as new in May 1953 to North Road Engineers, Oldham, “carrying Mason Tours fleetname”. Make of that what you can! It was withdrawn in June 1960 and exported to Australia where it ran for Stewart & Sons, Bundaberg, Queensland, rebodied by Stewarts with their own B57D body. It remained in service until some time in the 1990s, when it was bought by one of Stewarts’ drivers and converted to a mobile caravan. My info came from the PSVC Royal Tiger chassis list. On the SCT61 website, under a posting about Maudslay HNF 803, there is reference to ‘the Wolfenden group’, operators and coachbuilders (Junction). One of the group’s companies was Mason, whose address was North Road (Manchester, though, not Oldham). Leon’s Lion Utility double decker was in a small club of unusual Leyland Utility double deck rebodies. In 1942 East Kent had two of its ten 1928-1930 TS1 Tigers fitted with lowbridge Park Royal bodies UL27/26R with an overall length of 27ft 4in. The chassis had originally been bodied as double deckers, Short O30/26RO to an overall length of 27ft 6in. The two buses concerned were FN 9094 and JG 652 and merit attention for having the only lowbridge Park Royal Utility bodies (that I know of), and for retaining their original TS1 frames and acquiring long bodies as a result. They were quite camera shy with their new bodies but from the pictures I have seen there is no doubt that they were indeed rebodied on the original TS1 frames rather than receiving some sort of "TD1" substitute. The Park Royal bodies conformed to the National Federation of Vehicle Trades lowbridge utility outline (except on length and seating capacity) especially with regard to the proportions of the upper deck where the panels below the upper deck windows were much deeper than Brush, Duple and Weymann lowbridge bodies, to name just a few, and the roof had a pronounced dome.